A few years ago, I bought the Martha Stewart Cookies cookbook. I bought it mostly because the pictures are amazing, and make me want to eat the cookies right off the page. The index is my favorite part; complete with a mini-photo of each type of cookie in the book, with its recipe’s page number. I’m a very visual person, and often have a hard time using cookbooks that don’t have pictures of the food (if I can’t see it, how will I know if it will work? Obviously, a picture tells me that the dish will taste great…). This book suckered me into buying it, even though there are no vegan recipes and I was vegan at the time. I altered some of the recipes to make them vegan and they were fine. But now I’m not vegan anymore (I know, I talk about this all the time…Sorry), and I made these cookies using real butter and real eggs like the recipe calls for and dang. They were good! I can never make a recipe as is, I have to have at least one alteration and make my own version. I used this Martha original recipe, but added generous sprinkles (maybe two or three) of cloves and nutmeg to the batter. The cookies came out chewy in the middle, crisp on the outside, and deliciously spicy. Martha recommends adding raisins, toffee bits, or chocolate chunks. I opted for chocolate chips. Yum! 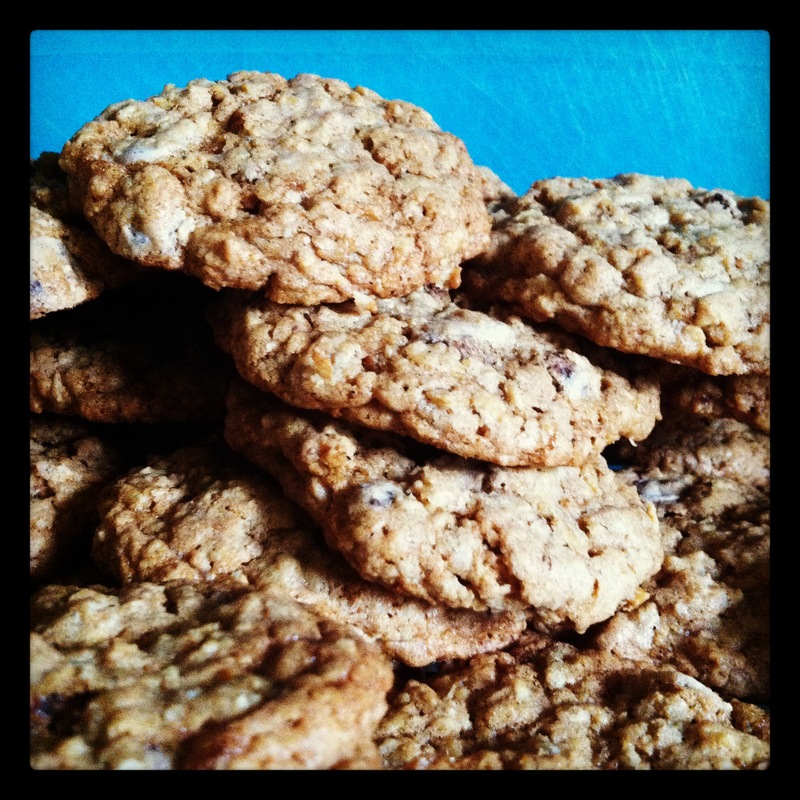 Warning: This recipe makes a ton of cookies! My friends were over one night and we ate a lot of fresh-out-of-the-oven cookies for dessert, I ate some in the following days at home, I brought a bucket of them to school to share with other teachers, and there were enough left over to freeze for a rainy day. It’s not raining right now, but hey, I might just go dig one out of the freezer right now…What better way to start out the day? I didn’t have any rolled oats around, but followed the link and ended up making some version of the banana-pecan-chocolate chunk cookies on the martha stewart website. Definitely the best cookies I’ve made!